The Bodhicharyavatara, or The Bodhisattva’s Way of Life, is a teaching from the Mahayana tradition of Buddhism—the tradition of the bodhisattva, the compassionate warrior. In the Mahayana, the emphasis is on awakening—on thinking bigger—so that you can benefit other By people. The author is Shantideva, a monk who lived in the eighth century in India. The first three chapters of The Bodhisattva’s Way of Life introduce us to the principle of bodhichitta and how it may arise in us. Bodhichitta—awakened heart or awakened mind—is something everyone has access to. It arises in everyone, and everyone has experienced it. The text says that it often appears like “a flash of lightning in the dark.” It’s like there’s an opening in the clouds. We sense that we’re connected to something that wakes us up and makes our world feel bigger. It makes our heart and our whole being feel expansive; we feel confident and inspired. But, unfortunately, our habitual patterns are so strong that the opening usually closes again. We revert to our old ways of staying stuck in negative mind. We get hooked again in our old patterns. But we do have these moments of awakening. And when we can begin to nurture them, and cherish them, they come out more and more. Then at some point the shift to being awake becomes irreversible: something shifts in our heart and our mind, and bodhicitta is no longer superficial. It becomes a part of our being. The entrance to the bodhisattva discipline. And I am destitute of learning and of skill with words. I wrote it only to sustain my understanding. May profit also, equal to myself and fortune. It isn’t easy to say what bodhicitta is. If you looked it up in a Buddhist dictionary, it would say something like: “The heartfelt longing or wish or aspiration to awaken fully, so that you could benefit sentient beings.” The aspiration is vast, because you wish to awaken not partially but fully. It’s vast because you wish to awaken so that you could benefit not just a few, but all sentient beings. And you aspire to benefit all beings not just at the relative level of housing and food and fear and abuse, but also at the absolute level of helping them help themselves so that they too can wake up fully. Full-blown bodhicitta is the global perspective that wants all beings to fulfill their potential. It is based on a growing confidence that all beings have the potential to wake up fully. Shantideva says, “Virtuous thoughts do rise, brief and transient, in the world.” We’ve all had this experience: you’re walking along, you’re complaining and judging everyone, you feel like you’re on a steady diet of poison, you’re driving everyone crazy—especially yourself—and then, BAM! Like a flash of lightning in the dark, something gets through your self-absorption. Sometimes it’s just a car backfiring, or maybe it’s a dharma teaching, but it wakes you up out of your self-absorption and you see that the sun has come out, the sky is beautiful, and there are birds flying across it. Suddenly the world is very large. Everybody knows the experience of being completely self-absorbed and then something gets through. That’s a flash of bodhichitta. That flash, though, feels fragile and fleeting. Meditators describe it often: “I felt like every time I meditated I was waking up more, and then I seemed to lose it.” That’s the fragility Shantideva is referring to: there’s a flash of lightning, you suddenly understand that the sun is always shining, but then the clouds cover over it. At some point, though, something shifts and you begin to have confidence that the underlying quality of your being is open and warm and radiant. You know that the sun is always shining. So the more you practice and study, the more you begin to view your emotional upheavals like weather changes. They can be captivating and convincing—they can hook you and drag you under—but at the same time, you begin to know they’re passing clouds. You’ve seen the sun and you have no doubt that it’s there behind the clouds. That makes your motivation to practice stronger, because you feel there’s nothing that could happen to you that wouldn’t be a doorway through these clouds, these temporary weather conditions. Take grief, for instance. Grief is completely pregnant with bodhichitta—it’s full of heart, love and compassion. But we tend to freeze or harden against grief because it’s so painful. We bring in the clouds. In fact, we’re good at bringing in the clouds and keeping them in place. We’re good at fixating on them. But when you practice the teachings that say, “Stay with the grief, see it as your link to all humanity,” you begin to understand that grief is a doorway to realizing that the sun is always shining. You begin to understand that the weather is transient like clouds in the sky. You begin to have more trust in the underlying goodness—the underlying “sun quality”—of your being. In this way, any experiences you have, particularly very strong emotions, are doorways to bodhichitta. The trick is to stay with the soft spot—the bodhichitta—and not harden over it. That’s the basic bodhichitta instruction: stay with the soft spot. How does this work? You’re going along, and your mind and heart are open. Then someone says something and you find yourself either frightened or starting to get angry. You feel the hair rising on the back of your neck, and something in you closes down. You’re on your way to becoming all worked up. At this point, you become unreasonable, and all your wisdom goes out the window. You’re hooked. This is what we work with as practitioners, as aspiring bodhisattvas: we have to be able to see where we get hooked like this. It’s easy to see. To interrupt the flow of it, though, is another matter. When you’re doing sitting practice, and you label your thoughts as “thinking,” and go back to your breath, you’re interrupting the momentum of fixation. Sometimes when you’re doing sitting practice, you can see that the thoughts themselves are like clouds in the sky—they just come and go and they’re no threat to us. So in terms of bodhichitta, when you get hooked or fixated and you’re off and running, it’s actually possible to touch the soft spot of what it is you’re trying to cover over—the anger, rage, frustration, grief, despair. Because inside what you’re trying to cover over is bodhichitta: the soft spot, the tender spot, the vulnerable, open heart and loving mind. The only thing that leads us to supreme joy is to interrupt the flow of fixation and to touch the soft spot of bodhichitta. None of us should turn our backs on bodhichitta, on learning how to contact this soft spot. “Should bodhichitta come to birth in one who suffers in the dungeons of samsara” is a description of ego. It’s like you’re enclosed in a cocoon and there’s no fresh air. But what if someone takes a penknife and slits the cocoon and suddenly light comes in through the darkness? What if you poke your head out and see the whole universe? The “slit” could be an explosion outside, or the sound of a bird, or someone teaching the dharma. Something gets through to your heart, and suddenly it seems like the whole universe is available to you. But then you go right back in. Shantideva says that should bodhichitta come to birth for even an instant, in that instant you are called a bodhisattva, the Buddha’s heir. You’re worthy of being bowed to by gods and men and women—by everyone. In that instant, you’re as full-blown a bodhisattva as those who spend their whole life cultivating bodhicitta—those who hardly ever get hooked. Maybe you’ll go back to being a schmuck, but you did have a glimpse of what it’s like to feel the heart and mind of a bodhisattva. In the beginning the contrast between being awake and being asleep is great; it feels like the clouds have the upper hand. But once you begin to hear the teachings on fixation and bodhichitta, you have tools that help you to stick your head out of the crack in the cocoon, and you begin to get enthusiastic about your potential to stay out there. But I’ll tell you one thing: expect relapses. That is why we need to seek support from people who will encourage us to open our hearts and minds. We need to stop seeking support from those who buy in to our complaining, the people who say, “You’re right, those people you think are awful, are awful,” and keep us caught in the small world. We need to find people and situations that encourage us to keep opening up, people who say, “You could look at it a different way.” Instead of wanting to punch them, we might actually listen to them. And makes of it the priceless body of a buddha. Such is the bodhichitta: we should grasp it firmly! Shantideva is saying that bodhichitta is like an alchemic substance—it can turn anything into gold. For instance, rage. Rage starts as a tightening. You buy into it, you get hooked, and then you lose control. What you want to do is catch the fact that you’ve been hooked, and realize that it’s got you in its grip. The sooner you realize you’re hooked, the easier the rage is to work with. But even if you’ve gone through the whole habitual rage cycle already—even if you’ve broken things, yelled at people, marched out of the house and left a trail of misery behind you—it’s still possible to sit down and get in touch with how fixated, how hooked, you are. It may take a few days, or it may not. But the kindest thing you could do for yourself is develop your capacity to realize you’re hooked before you start the whole catastrophe. You may not be able to meditate, or contact bodhichitta, but you can catch the fixation and interrupt its momentum. At some point when you’re more able to interrupt the momentum, you can begin to feel the quality underneath the tightening. That’s when it’s possible to touch the soft spot of the rage. There’s a lot of soft spot in rage, and it’s usually fear-based. Usually you feel hurt, and that’s why you get so angry. But without working with it—without touching the soft spot of the rage—you cause yourself and others a lot of pain. So if you can touch into the soft spot underneath the hardness, underneath the hookedness, underneath the clutchiness, then you can touch into the power of bodhichitta. There are many helpful practices you can do at that point. One is to think of all the other enraged people and feel a sense of kinship with their rage and the fact that they, like you, cause harm, and they, like you, could stop. At that point your world begins to get bigger. In that way even the most poisonous of things—things that cause the most harm to you and others—can become doorways to bodhichitta. As a way of dedicating this teaching and getting accustomed to thinking bigger, I’d like to look at a few verses at the end of The Bodhisattva’s Way of Life. Dedicating the teaching is a characteristic of the Mahayana: we think bigger than our usual self-absorption and realize our interconnectedness with other people. We take a global perspective and realize that just as what harms rivers in South America has an effect on the whole planet, in the same way, what harms us harms others, and what benefits us has a beneficial effect on other people. May every being tread the path to buddhahood. Joy and happiness in boundless measure. In constant and unbroken continuity. Taste the bliss and peace of Sukhavati. We know that there are many beings in the world today living in hellish states and suffering terribly every moment of their lives. Shantideva says, May those beings fettered there, tormented, taste the bliss and peace of freedom from fixation—the bliss of bodhichitta. 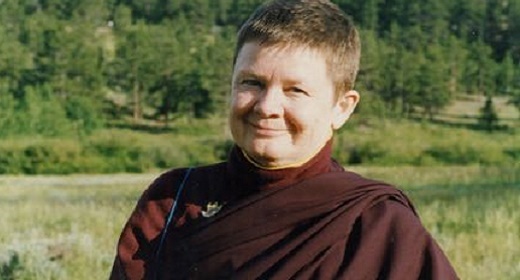 Pema Chödrön is a fully ordained Buddhist nun and the resident teacher at Gampo Abbey in Cape Breton, Nova Scotia. She is the author of several books, including The Wisdom of No Escape, When Things Fall Apart and Comfortable With Uncertainty. ©2004 by Pema Chödrön. All Rights Reserved.